There are five toy trailer trucks in the test fleet. The 5th one is on a road trip somewhere with the QA guy and could not be located for the photo. 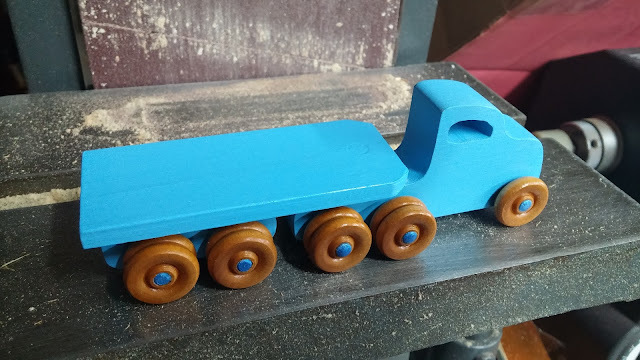 None of my toy trailer trucks to to date have followed the original pattern. It started with the wheels. I didn't think the trucks looked quite right The wheels for these are very inexpensive when purchased in quantity. So why not. Yep that looks like a truck. When the first truck cab was snitched by my grandson who refused to give it back even to get trailer attached I knew dual wheels were a winner. Next came the round nose on the trailer. On the first one I had to clip the corners on the trailer to get it to turn without hitting the cab. On the second trailer I used a circle gauge to layout the curve and cut it on my scroll saw. I liked this well enough that I'll likely continue to use it. Adding some rails. I had heard from others toy makers that little boys like to put their cars on these. The Play Pal toys all fit on the trailer as do Hot Wheels and Match Box cars. When I gave Odin his first trailer the very first thing he did was put a car on it. It rolled off and my three year old QA guy promptly told me it was broken. The first rails I added were eye balled. This didn't work very well. It was to narrow for most of the cars we had and most of them would rolled over the edge. The second rails were thought out a bit better. Higher and wider they keep the cars on the trailer when tilted to 45 degrees. The box trailer was just a whim that worked out very well. It looks a lot like the trucks the tree service guys use to haul away tree debris. This wasn't intentional. I didn't think of it until I was writing this. An idea for a new design with an arm for picking up debris and some outriggers to prevent tip overs while loading. This trailer was a bear to get in the clamps. 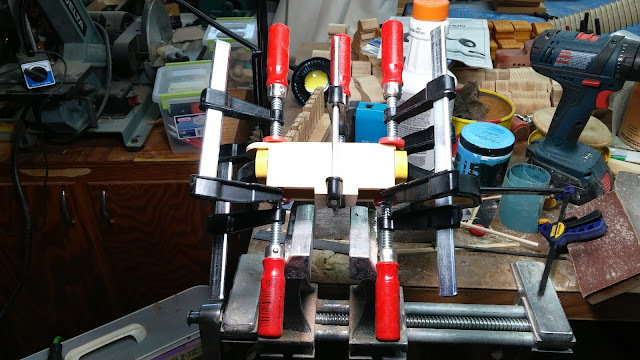 Either I need to change the design or make a jig. It's way to hard to clamp the box trailer pieces together.